I would like to say a big thank you to those of you who have been following us on our social media pages, our fan base is constantly growing and a particular thanks to those of you who have been busy sending us your stories – we love to hear them, so keep them coming! It has once again been a fantastic motorsport season, with a number of hugely talented youngsters coming through the ranks to fight with the established stars – particularly in MotoGP where a certain Marc Márquez not only became the first rookie to win the premier class since Kenny Roberts in 1978, but also the youngest ever Champion. We have a bit of a MotoGP special in this issue as we caught up with the subscription competition winners from our last issue of Performance, who enjoyed a fantastic weekend of action at the Silverstone round, as well as chatting to our MotoGP logistics coordinator Mark Hardisty; who reveals an insight into the hectic world of being a Logistics Co-ordinator for the Grand Prix circus. This issue also looks at the ultimate test between man and machine – the iconic Isle of Man TT. The two week festival is an event any motorsport enthusiast should attend at least once in their life, alongside the gruelling Nordschleife 24 hours – a personal highlight of the racing season for me. On four wheels we also look at the fast and furious world of the Super GT and Formula Nippon racing in Japan. Away from racing, this issue explores the world of customising machines – a scene that is continuing to go from strength to strength and one that Öhlins plays an important role within. 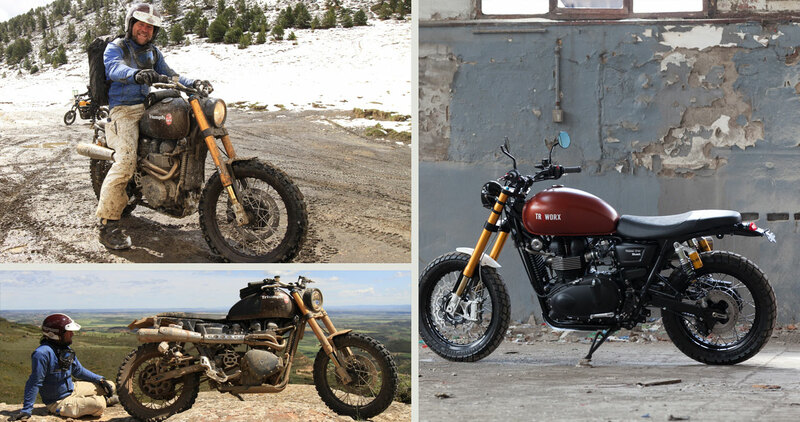 We feature the intriguing Austrian scriptwriter Uli Breè talking us through the very special Triumph Scrambler he built for a 1300km off-road journey, proving again that style is nothing without performance…. With winter fast approaching we are now also in the middle of the show season. Having recently enjoyed the EICMA event in Milan, where a number of new models were revealed, we now move on to Autosport International Show in January. Öhlins are also well represented on several other shows together with our distributors, for instance at the SEMA event, the Tokyo Motorshow and Paris Motorcycle fair plus many more. Please come by if you are at any of these shows. We hope you enjoy the stories in this edition of Performance, and you can always view the previous editions of the magazine in ‘PAST EDITIONS’. Steeped in its own unique Manx culture and heritage, the island remains a quaint and peaceful retreat for the majority of the year. However, for two weeks in June the island comes alive with the thrill of adrenaline fuelled ‘between the hedges’ racing as the TT kicks off. There is little doubt in the dangers of the course, with average speeds of over 131 mph over a 37 ¾ mile lap that features some 264 corners between hedges, lamp posts, phone boxes, stone walls and houses. That is part of the attraction though as many riders are drawn to the Island to test themselves with massive risk against the world’s toughest course. For fans, the very nature of the public roads course means they witness the action unfold less than an arm’s length in front of them– something you cannot experience at regular, short circuit race tracks. 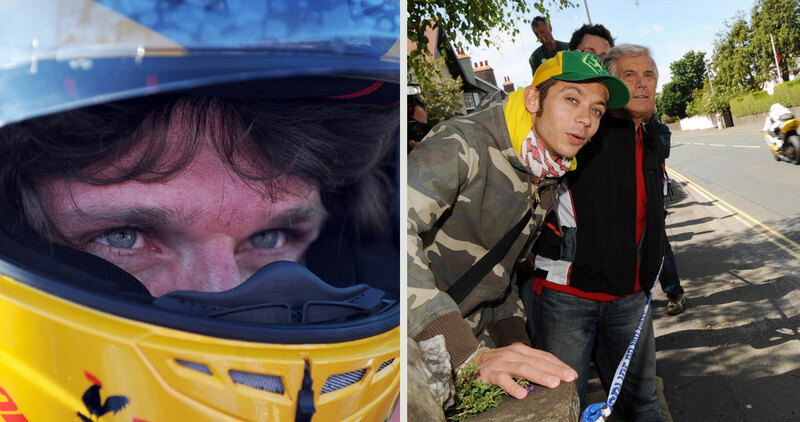 In the 2010 Senior TT, the blue-riband event, he lost control of his motorcycle at Ballagarey – one of the fastest corners on the course – and crashed at over 170mph, turning his machine into a fireball, before finally came to a halt 400 yards up the road. You could then forgive Martin for retiring there and then, yet the accident had an opposite effect, recalling the crash he said, “The buzz from that was just unbeatable. That moment between crashing and almost dying? That raised the benchmark. I want to get back to that point. Money can’t buy it, everything has been so sanitised with PC nonsense and health and safety that there is nothing else like it. If it was dead safe I wouldn’t do it.” The statistics speak for themselves as 240 riders have passed away chasing the ultimate two-wheel dream since 1907. 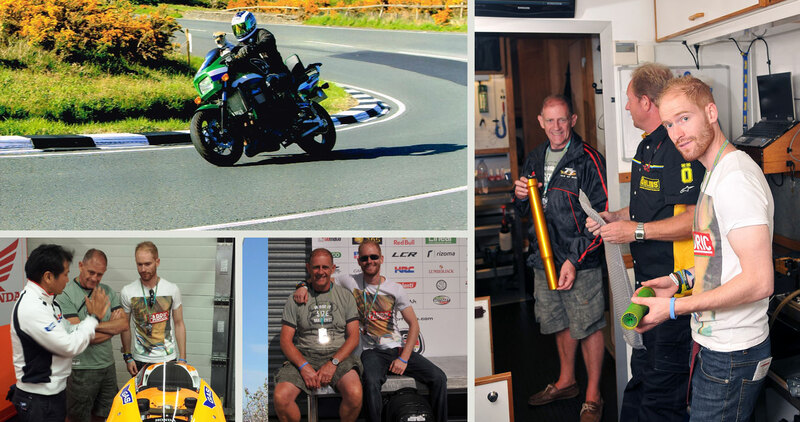 In the seminal film ‘Closer to the Edge’, Bridget Dobbs, the New Zealand widow of the late Paul “Dobbsy” Dobbs, offers a pragmatic view on the unconditional love the TT attracts, “You don’t stop because you stop winning. Because the lap is so long, there is not a lot of time to sort things out, so it’s a real challenge to make the right adjustments when the rider comes back in. You also have to consider the fast sweeping corners up on the Mountain combined with the bumpy rippled roads at other points so it’s all about finding the right compromise. Almost incredibly, Guy has never won a TT, despite the throngs willing him along from the dry stone walls and bankings. This year’s man of the moment was Irishman Michael Dunlop who won four of the five major races, including two on Öhlins equipped Honda CBR600 machinery. A hard, seemingly angry young man, Dunlop also has his legions of fans but does not enjoy the attention that Martin attracts. 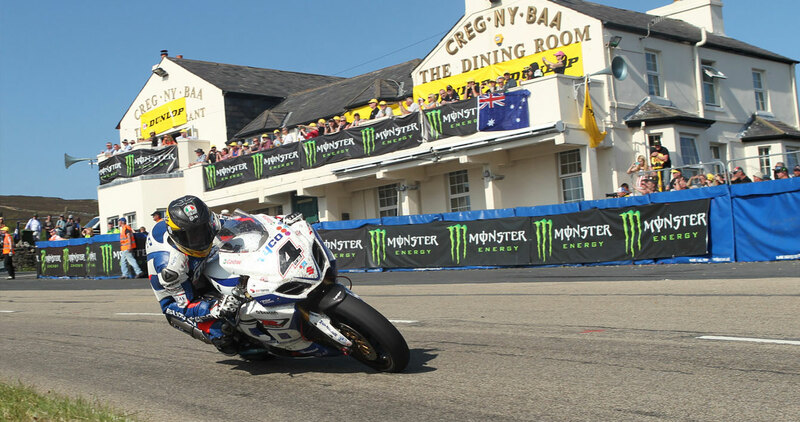 Of course it is not just the racing that entices thousands of fans every year, the fortnight long event is known as the Isle Of Man TT Festival and throughout both practice and race week the island is awash with entertainment. From beer tents and bands to stunt shows, drag racing and the Red Arrows – the TT caters for visitors of all ages. Douglas Promenade remains one of the most popular nightspots for fans. Stunt shows outside the Villa Marina, aptly dubbed “TT Mayhem”, is the best way to begin your night as the motorcycle stunt display teams perform gravity-defying displays to a packed audience. For the thousands of fans who ride over on their bikes, part of the attraction is to ride as many laps as possible following the wheel tracks of their heroes. ‘Mad Sunday’ as it is known, is the day when the police turn the legendary Mountain section of the course into a one way virtual race track for the public with no speed limits. It has to be seen to be believed! So if you’ve not been, make sure that one day you make the pilgrimage to this incredible and unique event! 03 – Twenty four hours at the green hell! The track is legendary. A 25 km long ribbon of tarmac where Niki Lauda almost passed away in the 1976 Formula 1 race. It is a track open to the public all year round to throw themselves and their cars around for one or any number of laps. It is a track where car manufacturers test their performance machines alongside the public. And it still hosts races – the endurance VLN for GT and Touring cars plus of course the famous 24 Hour race. Like the TT, every May- June each year the 24 Hour race is held and the scenes around the track are something unique. Fans bring out not only tents but living room furniture, complete bars and as we just witnessed even engines and chainsaws (plus of course a lot of beer) for a four day long race party among the forests. Meanwhile the drivers and teams fight to master this notoriously difficult track. The 25 kilometers known as the ‘Nordschleife’ consists of over 150 corners, jumps and a 3 km long engine busting straight. For the races it connects to the Grand Prix track and it is a special feeling to race here. 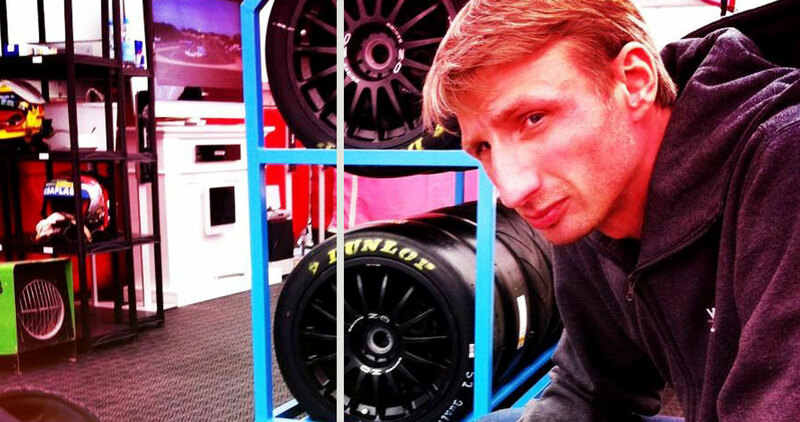 Öhlins test driver (and son of!) Martin Öhlin drove the race in 2010 when he finished third overall in the GT3 class. He describes the special feeling the circuit evokes. The race was first run in 1970 although marathon endurance races had been held previously. Today the race is run once a year and sees over 200 cars enter the event with typically three to four drivers per car. The last few years has seen an increased involvement from the major manufacturers who bring out their best GT machinery, staff and drivers to fight for the overall honours. The weather is notoriously difficult in the Eifel region and this year is no exception. It is practice before the race and drivers are out on track to get up to speed, help the engineers fine tune the cars and of course complete their mandatory laps to be eligible to start the race. Even though it is Thursday and two days until the race starts, spectators are already out in force. The traffic on the roads around the track and through the many small villages is already heavy. The public greets the drivers showing the most aggression and pushing hard with air horns and noise. Anyone who takes it easy are meet with boo’s and encouragement to up the pace. And this is just the beginning, for the race the spectators increase tenfold and over 200,000 fans are expected to follow the proceedings. “Nürburgring can be absolutely fantastic when it’s dry and nice weather. But it can be equally devilish and really the Green Hell when it’s dark in the night with heavy rain. As a racing driver that is a challenge you don’t get anywhere else in the world and it is magical. This is an extremely fast track with an average speed over 180 kp/h on a fast lap and to drive such a track in the night in heavy rain and fog and where you have severe aquaplaning maybe 10 times per lap and with blind entry to the corners and over crests and always very close to the barriers is frightening. But it is also absolutely fantastic and that challenge is why you keep coming back to this race year after year. You don’t get this anywhere else and it is a very pure driving experience. Richard is known for being an expert in the night stints, especially when the conditions are difficult and they don’t come more difficult than they did in this race. Around midnight, seven hours into the race, the rain was so hard and the fog so dense the organisers had no alternative but to stop the race. An onboard video gone viral from American Leh Keen’s Porsche show the extraordinary conditions drivers had to face. The race was then resumed at eight in the morning for a nine hour sprint to the finish. The rain falls hard all night and with the fog and darkness combined it is impossible to resume racing until then. Before the race was red flagged we went around to some of the more popular viewing places. In among the high end GT machinery and touring cars is a fan favourite each year – an Opel Manta complete with a fox tail at the antenna. It is this mix that makes the 24-hour race here so special, factory teams and drivers with some of the fastest GT-cars in the world are mixed with amateur Nürburgring specialists in small family run teams. Even though the track is long, the drivers are constantly fighting through traffic, either overtaking slower cars or being passed by faster cars. Before the race was red flagged we went around to some of the more popular viewing places. In among the high end GT machinery and touring cars is a fan favourite each year – an Opel Manta complete with a fox tail at the antenna. It is this mix that makes the 24-hour race here so special, factory teams and drivers with some of the fastest GT-cars in the world are mixed with amateur Nürburgring specialists in small family run teams.Even though the track is long, the drivers are constantly fighting through traffic, either overtaking slower cars or being passed by faster cars. A stroll in the pits is also a special feeling. Access for the ordinary fan is surprisingly good and a peak into the pit garages reveal another special element to this race. In each pit box up to six cars from different teams share space to accommodate the 200+ cars entered in the race. With six cars from up to six teams all sharing the pit box it can get very chaotic but in this chaos there is Teutonic planning and structure. Throughout the weekend the teams manage to share this confined space even during pit stops! 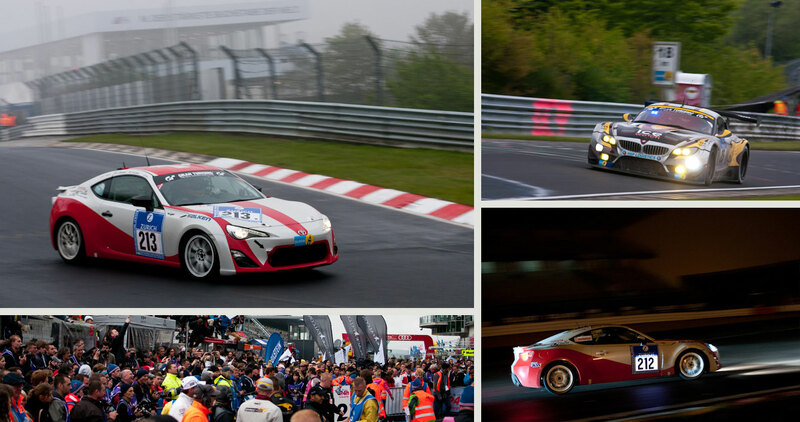 The Nürburgring 24-hour race is worth a visit for every race fan. A unique event that compares to nothing else in the car world. Just make sure you bring waterproofs… Chainsaw optional ! Built in the 1920’s this is one of the last surviving, truly legendary tracks in the Racing World. Combined with the GP track the lap is over 25 km long with over 150 corners and over 300 metres of elevation change. 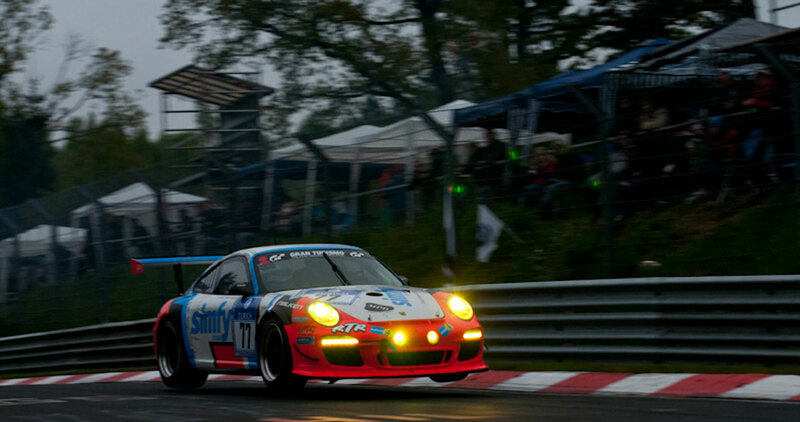 The track is used for racing in the German endurance championship VLN with races between 4 and 6 hours long. A ‘time attack’ style championship called RCN is also held at Nordschleife and each year the 24 hour race is the highlight for most racefans. 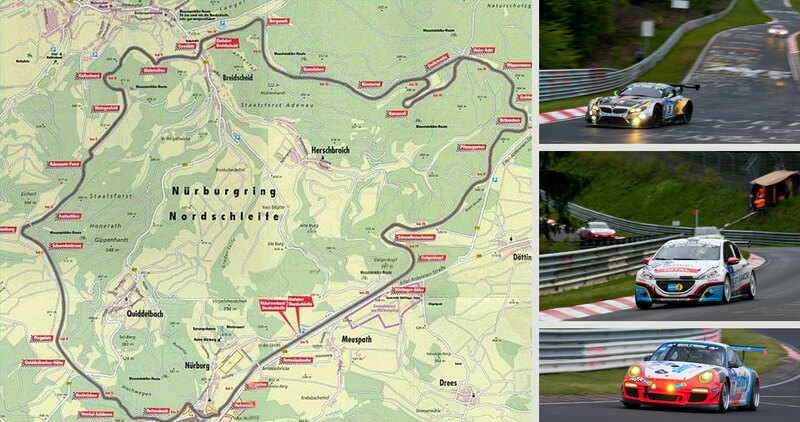 For the VLN and 24 hour race Nordschleife is connected to the Nürburgring Grand Prix track. The Nordschleife itself is also open for trackdays and public days, when there are no races held and it’s open for everyone wanting to go and buy a ticket to drive a lap around the famous track. Nordschleife itself was used for F1-races up until 1976 when Niki Lauda had a terrible crash at Bergwerk, an event replayed in the recently released hit movie ‘Rush’. F1 stopped racing at the track after that but the brutal Group C Sportscars still used the track for racing and it’s from this era the lap record still stands. German driver Stefan Bellof drove the lap in a Porsche Group C Sportscar in 6 minutes and 11 seconds – an average speed of 202 km/h and a lap record that still stands to this day. 04 – Motogp competition – The right guys! Edwin Savage, or Eddie to his friends, definitely got his ‘money’s worth’ of his visit to the Silverstone GP after winning the trip of a lifetime by subscribing to Performance and he really threw himself into the occasion. Eddie and his son Owain decided to camp for the weekend at Silverstone so they could really live the experience, despite as Eddie reminisces, “I haven’t been here since it was Roberts and Sheene battling it out, I’ll always remember as we were camping again and I forgot the tent pegs. Had to use knives and forks…” As luck would have it the circuit held a fitting ten year anniversary tribute to Sheene’s passing that very weekend, with his friend Steve Parrish, brother-in-law Paul Smart and nephew Scott Smart all perfoming parade laps at this iconic circuit. A regular Isle of Man TT marshal, Eddie is certainly a well known minor celebrity, but mostly because of his passenger… Molly. On Saturday night the ‘Savages’ enjoyed a wedding in the LCR hospitality and when the Öhlins team arrived on race day, the pair seemed to be on great terms with all the staff including team owner Lucio Cecchinello! So we think it’s fair to say that the right guys won the competition! 05 – Öhlins TTR – ‘Big in Japan’! While the Championship follows its European counterparts closely in terms of technical regulations, they do follow some important exceptions. The machine used is the ‘FN09’, a specially developed vehicle built to the exact regulations of the Championship by American company Swift Engineering. Like all formula cars, the main monocoque shell is made of a carbon composite, with the engine mounted in the rear of the chassis using a stressed mount system. The basic construction of these race cars is comparable with the safety and performance of Formula 1 cars. The championship attracts not only the top Japanese drivers but also international drivers and several F1 drivers including Ralf Schumacher, Pedro de la Rosa, Eddie Irvine and Ralph Firman to name just a few raced in the category prior to moving to Formula 1. Audi’s Le Mans stars Benoît Tréluyer, Loic Duval and Andre Lotterer also race in the category in addition to their Endurance duties with Audi Sport. The Super GT series, formally known as the All Japan Grand Touring Car Championship (JGTC), is important in Japan, a country enthralled with this term especially given the ultra popular game out there ‘Gran Turismo’! The Championship offers a unique difference to the majority of the racing series in the country by the fact it is directly authorized by the Fédération Internationale de l’Automobile (FIA) just like Super Formula. Unlike the single seater category, Endurance GT racing has longer races and driver changes. The races are between two and six hours long, one event of the year is the six hour race at Suzuka. 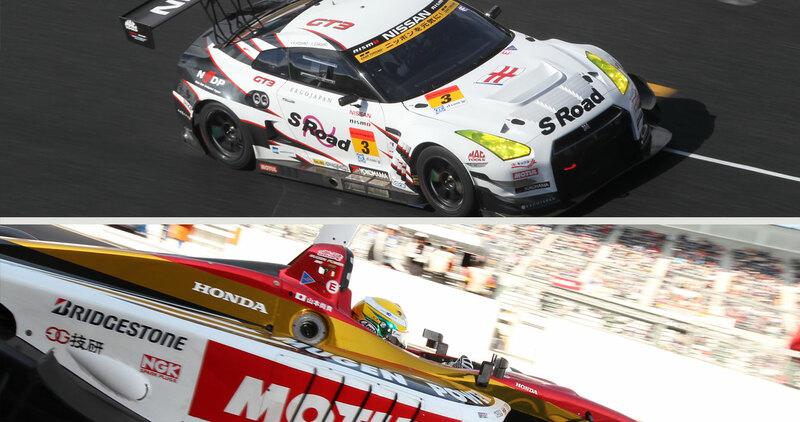 There are two separate categories in the race, the GT500 and GT300 classes. In the bigger 500 class, three manufacturers dominate proceedings – Honda, Nissan and Toyota/Lexus have won the vast majority of the Championships to date. Lately there’s been increased talks between Super GT and DTM to share technical regulations and this has led to Super GT presenting a new set of technical regulations for 2014. Honda, Lexus and Nissan showed their new cars for 2014 earlier this year and they share a lot more similarities with the DTM regulations. The similarities between the two championships is set to increase, and will be joined by the American Grand Am platform with the goal of the three series to share technical regulations by 2017. 06 – New age customising – The need for go and show! Klock Werks Kustom Cycles in America have experienced a similar trend. “For sure the custom scene is growing,” said VP Laura Klock, “We are finding more people coming to talk to us wanting something different to the standard machine that anyone can pick up from a dealer or secondhand. The only problem we find with this is that designing and creating completely new, bespoke and unique machines becomes tougher when there are so many around! “This is one of the reasons we like to build really different machines – take our recent project, a 2013 Triumph Thunderbird Storm. This is a big ‘bruiser cruiser’, but instead of turning it into another custom cruiser, or chopper, we thought we would go to the extreme and completely transform it into a Cafe Racer! 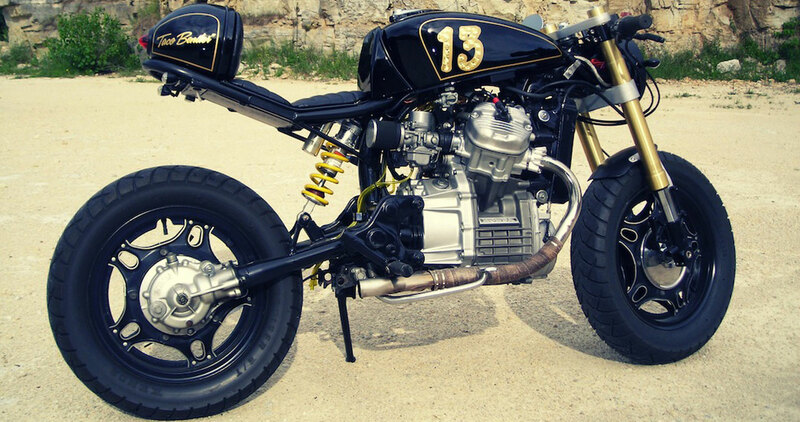 “Of course, turning such a big bike into a Cafe Racer is no easy task and it took a lot of work, a lot of imagination and some dry wit! At the base of the ‘Kafe Storm’, as we called it, remains the big 1699cc Twin cylinder DOHC Water cooled Triumph engine but the rest of the bike was inspired by a 1937 Graham “Shark Nose” automobile. This inspiration was sparked by the horizontal fining on the Triumphs engine, resembling the chrome grillwork on the original car. Manufacturers themselves are showing more interest in custom machines too, as the Spirit of the Seventies found out in 2012 when Kawasaki UK commissioned them to transform a W800 into a unique and eye catching design. As further proof of the growing interest, the Spirit W800 was then displayed on the Kawasaki stand at the Motorcycle Live show at Birmingham’s NEC centre. Similarly manufacturers have turned bikes over to customisers before the public get to see them such as the MT-01. Tim continues, “Obviously looks and style remain the key factor in custom machines, biking is all about camaraderie and lots of bikers go to meets and like to show off, so a bespoke design unique to them is something they can proudly display. That said, performance is just as important nowadays and our recent Triumph 675 commission is a great example of these two ideas combining. Also turning heads across the World is the German built Triworx ‘Raise the Dust’ machine, the ultimate in the style of stripped down ‘Scrambler’ featuring 43mm upside down Öhlins forks and rear shock. With wide MX bars and super knobbly tyres, this Triumph certainly ‘Goes its Own Way’ to coin their slogan! See our feature story for more on this fascinating machine…. As previously featured in Performance, the Warrs Harley Davidson customisers have seen their requests and creations change 180 degrees over the years. Chief designer Charlie Stockwell explains “I’ve been building customs since 2001, and the style of the machines has definitely changed over the years. We find that people look to us at Warrs and to what we’re producing and often follow suit, so a ‘trend’ then starts. I’ve always liked to build slightly unorthodox customs, machines that people look at and think I must be crazy for building that! 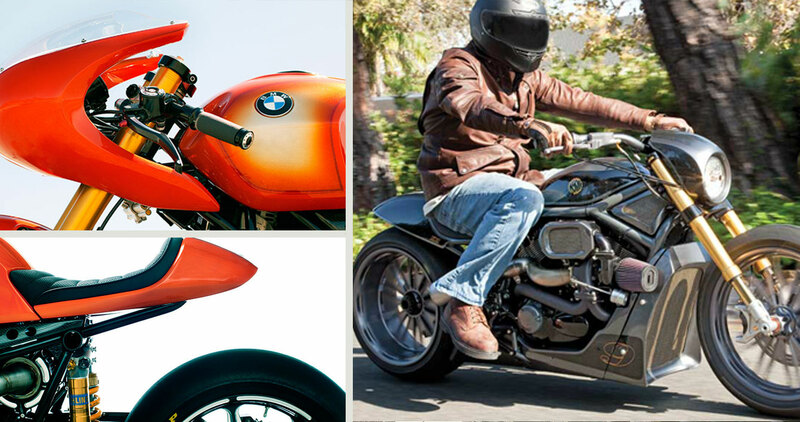 Now they have created a thing of beauty in the RSD BMW Concept 90 – a one off concept built to celebrate not only the 90th anniversary of BMW, but also the 40th anniversary of the R 90 S. The bike was unveiled at the Concorso d’Eleganza Villa d’Este 2013 show to universal acclaim. “People probably do not realise just how much it takes to make sure we have the best racing products available. In MotoGP we have thirteen full-time members of staff, with a real mix of nationalities – there is one Swede, four English, one Irish, one Scottish, one Australian, two New Zealanders, one Belgian (who speaks seven languages! ), a Spaniard and an Italian. In World Superbikes there are four – an American, Swede, Austrian and Englishman. In MotoGP, Öhlins use two articulated trailers for every European race meeting and test session. These are used for all the service work and to repair any units that have suffered crash damage. For World Superbikes, one rigid truck is taken to each of the fourteen rounds in the series. 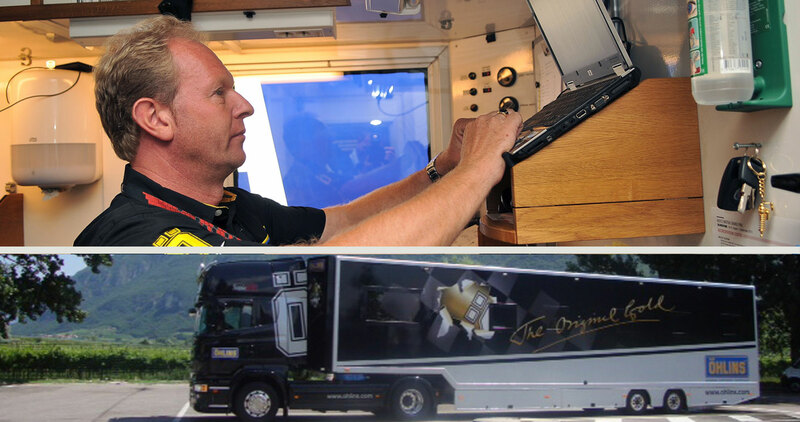 Mark is one of two drivers of the MotoGP trucks and everything is meticulously planned to ensure that they reach their destinations on time, meaning they are completely self-sufficient when on the road, even staying in the cab of the trucks when away from the circuits. The actual suspension units are carried by the teams themselves between races, with each Öhlins rider typically having five sets of forks and five shocks. “A typical schedule for a European round sees us arrive at the circuit around 4pm on the Tuesday before. We arrive with the MotoGP support trucks and once parked the first thing to do is connect the power so we have internet and the TV for track feed, clean the truck, service and empty work stations, check gas and oil supplies so we’re ready to go. “Thursday is the day the teams begin to bring their suspension from the last race to the trailer for any crash inspections or service work. The technicians then go to their respective teams and begin to discuss the set up for the first free practice session on Friday. Depending on the work load Thursday can finish quite late – often anytime between 8pm to 10pm. It is a similar story on Friday and Saturday. “For the six flyaway races, we send flight boxes with enough spare parts to deal with any situation. The technicians work from cabin style workshops at the back of the pit garages – we try to encourage the Moto2 and Moto3 teams to have routine service work done before we leave as we have more space and equipment with the two trucks, but everything that we can do at the European rounds can still be done at the fly-aways. Although it is a tough job that can see him away from friends and family for long periods of time, Mark still would not change a thing, “Of course there are hard times, I enjoy the lifestyle road but for those with families maybe being away from home for so long is tough, and when we have tragedy’s such as the accidents that saw Tomizawa and Simoncelli lose their lives, but that aside it is still my dream job. 09 – Raising dust and hell! Responsible for the World famous Tridays events in Austria, Breè also devised a Rally route over the Pyrenees but instead of riding an Enduro bike, he used a Triworks creation. Brée is one of the most renowned theatre and television writers in Austria but his great passion is for motorcycling, especially all things Triumph. He had an idea to bring together fellow fans of the Hinckley brand and Tridays was devised. For three days, everything in the small picturesque Austrian town of Neukirchen becomes English. English food, English bands, English street signs, English comedians, English weather and of course very English bikes! So successful and innovative was the idea, that as it grew Triumph Germany gave Brée a helping hand with bikes for marshals, a pop up on site dealership and fleets of bikes for testing. 20,000 fans now flock to the event, many as a cross European pilgrimage. 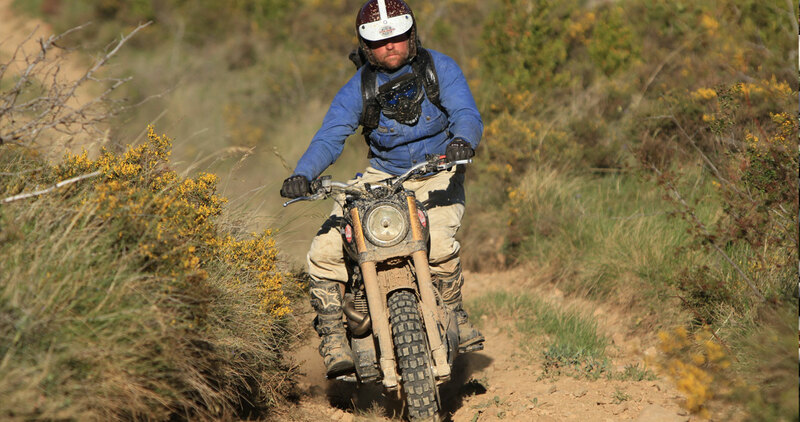 Always a man to keep exploring new opportunities, Brée then set up Transpyrenäica , a roadbook rally crossing the Pyrenees from the Mediterranean to the Atlantic, a route which is approximately 1300 km off road. It was at this point that the name ‘Raise the Dust’ was imagined, both for the journey and the machine to make the trip. Breé explains, “So with the trip planned I just had to find some crazy fellow adventurers, whose lives I could make difficult! I harassed three motorcycling aficionados; Jens vom Brauck (JvB), Jochen Schmitz-Linkweiler (LSL) and Wim Peters (Öhlins) into agreeing to my idea; ‘we would ride the Transpyrenäica on 220 kilo Scramblers’. So here we would have four guys from 41-62 years old, but this made sense, a Scrambler is also an ancient concept! 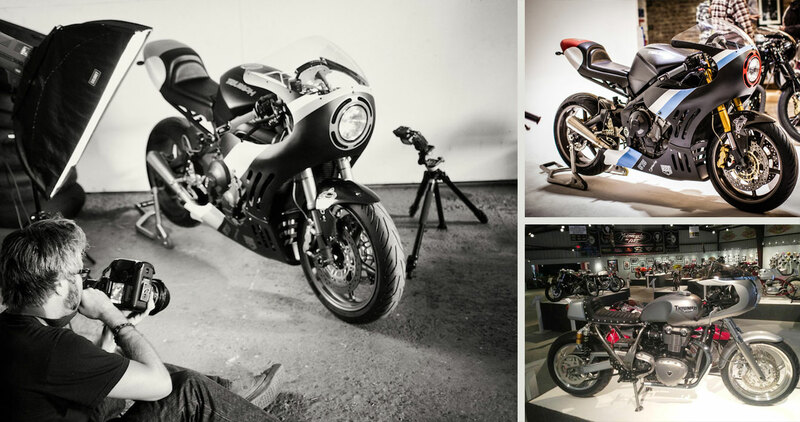 Utilizing the customising skills of LSL, JvB Moto and equipment from Öhlins, the bike building began, “We wanted the bikes to be individually built to the dream of each rider and therefore four completely different creations emerged. After half a year of intense motorcycle and some subtle body alterations we were finally ready.” An accompanying film crew added logistical issues to an already complicated trip but the quartet approached the challenge with great enthusiasm. So inspirational was the event there is even a song about the voyage! A standard Triumph Scrambler mated with high end components formed the basis for the distinctive look of “the Rumbler”. From the lamp trim through to the mudguards, side covers and bench seat the ethos of the 60’s was held true. With the help of a unique Öhlins set-up with aggressive Metzeler off-road tyres (with dimensions of 110/80-19 and 140/80-18) the Scrambler stands noticeably higher off the ground. Upside-down triple clamps made especially for the two-cylinder machine mean the correct castor angle is achieved with less offset. A 320mm wave-disc combined with 4-pot Brembo radial calipers completes the ‘competition’ edge. LSL Roadster handlebars are for pure ‘long ride’ ergonomics, while knurled footrests offer a secure stance in the many tricky conditions. This year’s MotoGP season has been all about one man – Marc Márquez. At just 20 years old, the Repsol Honda sensation stunned the paddock with his sheer speed and consistency during his rookie year, taking six victories and a further ten podiums on his way to becoming the youngest ever premier class Champion. In the lower capacity Moto2 class, a season long battle between Spanish rider Pol Espargaro, brother of CRT Champion Aleix, and Britain’s Scott Redding came to an unscheduled end in Australia when Redding suffered a nasty highside, resulting in him fracturing his wrist. Despite returning to action less than a week later, he was involved in another rider’s accident on the opening lap, allowing Espargaro to secure an unassailable lead. Almost the entire MotoGP and Moto2 class use the iconic gold and yellow suspension of Öhlins, making the Swedish equipment the weapon of choice for the world’s leading motorcycle racers. 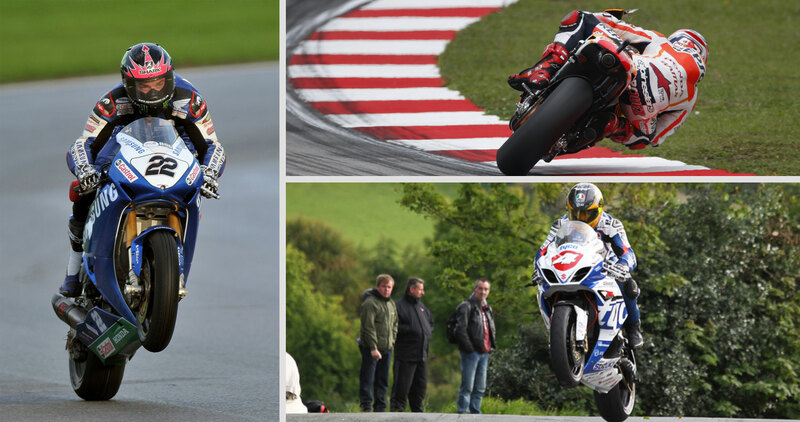 As always, Öhlins have enjoyed a strong and highly successful racing season in some of the world’s leading domestic two wheel championships, including the prestigious British Superbike and AMA US Superbike Championships. In the world of Endurance racing, the Audi squad of Tom Kristensen, Allan McNish and Loïc Duval had a perfect season. After having won the Le Mans 24-hour race, which was Duval’s first win in the classic, McNish’s third and an incredible ninth for Kristensen, the trio went on to claim the World Endurance title with a round to go. While looking at Endurance, in Japan Yuji Tacikawa and Kohei Hirate won the Japanese SuperGT500 in the Lexus and in the Gt300 category, Hideki Mutoh and Yuhki Nakayama won in their Hondas. At this years Nürburgring 24-hours, the Peugeot 208 GTI team of Christiann Frankenhout, Vincent Radermecker, Johnny Niderhauser and Giacomo Ricci won the SP2T class. 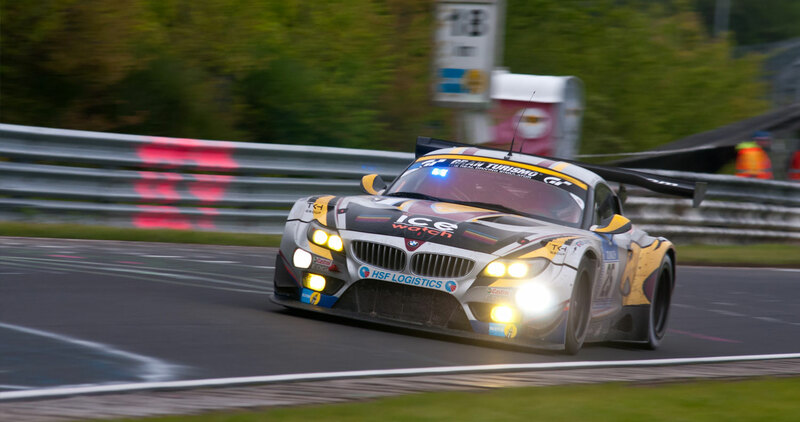 Overall the Marc VDS entered BMW Z4 GT3 driven by Max Martin, Richard Göransson, Andrea Piccini and Yelmer Buurman starred in the rain when they eventually finished second overall in the classic. 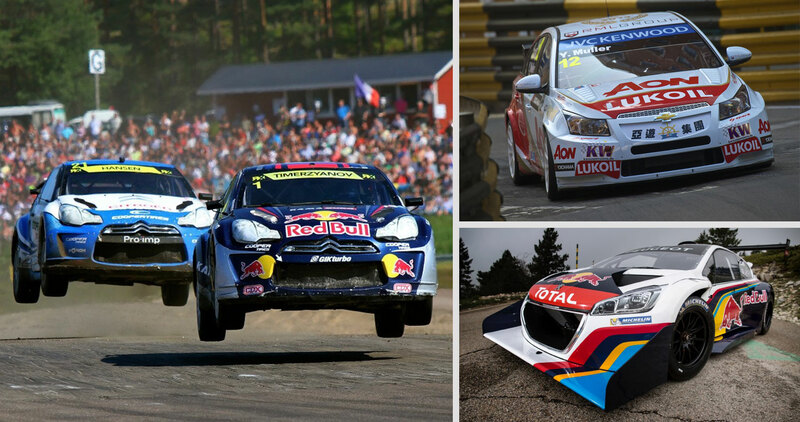 Rallycross has had a big lift this year after IMG stepped in to promote the European Championship. With fields expanding with the powerful and sensational Rallycross cars, the championship battle over the nine rounds was exciting. Big names joined the Championship from both the racing and rally world, but in the end it was Russian rallycross specialist Timur Timerzyanov who was crowned the European champion in his Citroën DS3. For next year the series moves on to be a World Championship, and already more drivers, teams and manufacturers have announced they will be competing. Frenchman Yvan Muller took his fourth WTCC-title in 2013 in what on paper looked like an easy season for him andthe RML Chevrolet team. However, Muller himself claimed this was the most satisfying and hardest WTCC-title yet due to the amount of work needed by Muller and RML before the season even began. Muller won seven races during the season and finished comfortably ahead of his rivals. He now moves to Citroën for next year as they join the WTCC. And speaking of touring cars, in the Italian Superstars series former F1-driver Gianni Morbidelli claimed the title in his Audi RS5. Öhlins Japanese distributor Carozzeria has a long and successful history in the Formula Nippon and Super GT paddocks and this year was no exception. In the main Japanese single seater championship, Super Formula (previously Formula Nippon), it was once again Öhlins TTR runners on top. With Andre Lotterer and Loïc Duval away on Audi duties it was Naoki Yamamoto who claimed the title in the end. Despite missing the final round, Lotterer finished second overall with Duval third. There wasn’t much doubt beforehand that they would do it but still it had to be done. Peugeot Sport and seven-time rally world champion Sébastien Loeb teamed up for a record run in the Pikes Peak classic mountain climb. The extreme Peugeot 208 T16 Pikes Peak stormed to a record run of 8:13.878 up the mountain, best described in this video from Peugeot. 04 - Motogp competition - The right guys! 05 - Öhlins TTR - 'Big in Japan'! 09 - Raising dust and hell!